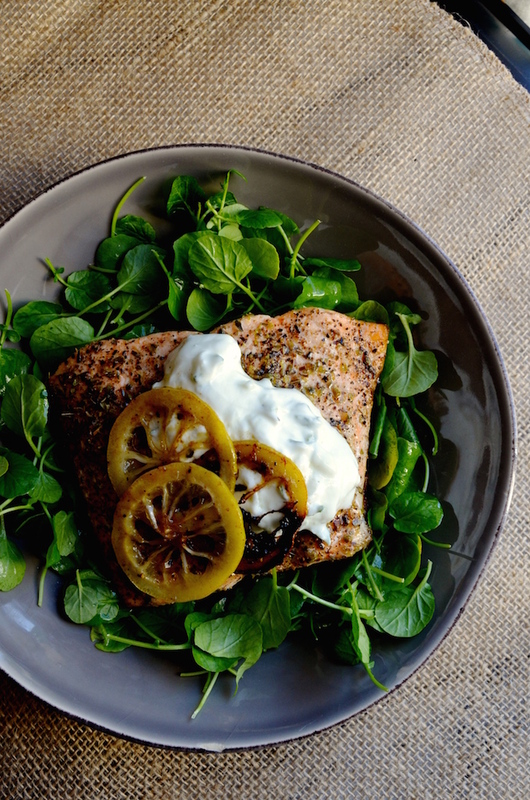 If getting dinner on the table as quickly as possible is your goal, this easy salmon recipe is probably going to become your new best friend. It's elegant enough to be the sort of thing you'd order out at a fancy restaurant, but is even easier to cook than chicken. I love cooking salmon. I think of it as the ultimate "convenience" food. It generally comes already cut to the perfect size, requires minimal seasoning, and takes mere minutes to cook. It makes for a great simple and satisfying lunch or weekday dinner, but can also work perfectly for a special occasion (like a birthday or Valentine's Day dinner at home). In larger pieces, it's fantastic for a dinner party. This recipe takes less than 10 minutes to make. You start by preheating your broiler (if you don't have a broiler, then just crank up your oven as high as it will go). Then coat the bottom of a heavy oven-proof skillet (I like something cast iron) with olive oil and heat over medium heat. While everything is heating, remove the fish from the package and blot dry with paper towel. Drizzle generously with olive oil then season with plenty of kosher salt, freshly cracked black pepper, and dried oregano. Place the fish on the hot skillet and remove from the heat (turn off the stove). If you'd like, you can toss in a few thin slices of lemon, then pop it right into the oven. Set the timer for 7 minutes and let it broil. 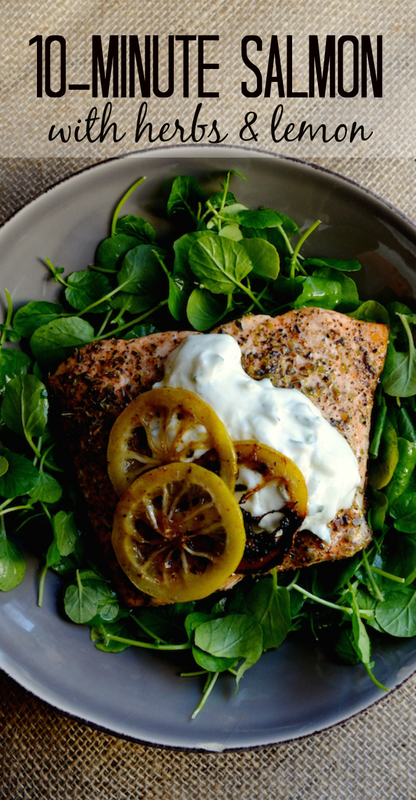 The salmon will firm up and develop a bit of color on top. The skin will get crispy around the edges. When the timer rings, it's good to go! Remove from the oven and let sit in the pan for another minute or two while you prep the rest of the dish. You can go with your favorite side (I love steaming up some quick frozen veggies then topping with a pat of butter) or just pile a bunch of salad greens onto a dish. 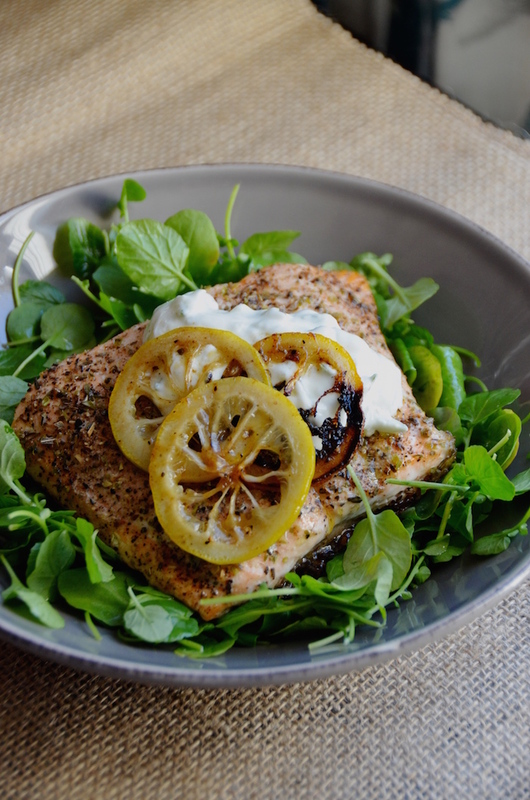 Top with the salmon and the lemon slices. I added a big dollop of tzatziki to mine, just because it happened to be in the fridge. Plain yogurt would be great, too. Or hummus or babaganoush or pesto or a dollop of grainy mustard--whatever you prefer and have on hand. Oh and if you have leftovers? They make for a great salad or sandwich the next day. No need to reheat--just shred with your hand and serve cold. Preheat broiler. Coat the bottom of a heavy-bottom skillet with olive oil and place over medium-high heat until the oil starts to shimmer and the pan is hot. 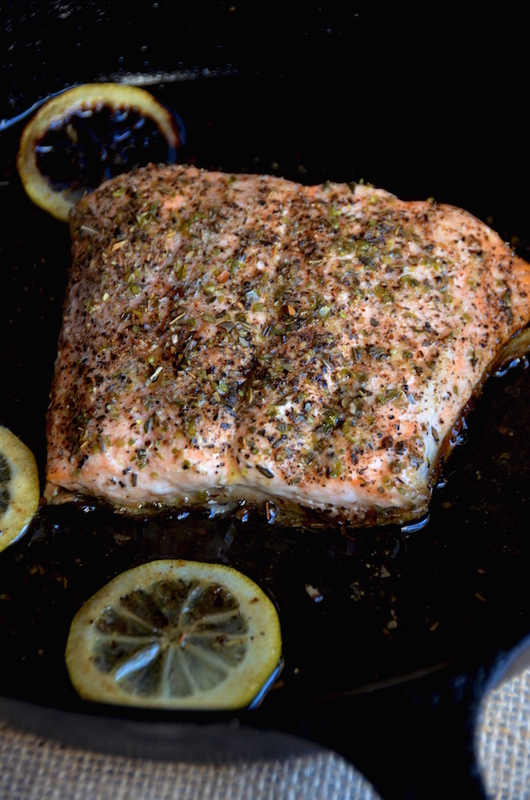 While the pan heats, drizzle salmon with olive oil and season generously with kosher salt, black pepper, and dried oregano. Cover each filet completely. Place filets on hot skillet, add the lemon slices, then immediately transfer to the oven to broil. Set a timer for 7 minutes. Remove from the oven and let sit in hot pan (off the heat) for an additional 2-3 minutes to finish cooking. Transfer to a serving plate and serve with desired accompaniments.